There is a common belief today that "all roads lead to God." While it is noble to respect each other's religious faith, the Bible teaches that the only way a person can be reconciled to God is on God's terms. Here are five "landmarks" that set Christianity apart from other roads. The Bible is the only inspired, infallible Word of God Historians agree as to the authenticity of the New and Old Testament writings, and contrary to popular belief, transmission of the text was completed with 99.99% precision. Conclusive evidence for the infallibility of the Bible includes: the bibliographicaltest; historical and archaeological confirmations; the Bible's harmony and unity (considering it contains 66 books written over 1,500 years, by 40 authors on 3 continents); and the Bible's fulfilled predictive prophecies. There were 330 specific prophecies about the coming Messiah in the Old Testament--fulfilled with 100% accuracy in the life of Jesus centuries later God spoke to the Old Testament prophets revealing history in advance because he is outside of time. The Bible itself declares, "All scripture is given by inspiration of God by the Holy Spirit] . . . ."
REFERENCE: 2 Timothy 3:16; 2 Peter 1:19-21; Matthew 5:18, 24:35; Psalm 119:89. GOD HIMSELF IS THE FOUNDER OF CHRISTIANITY. The God of the Bible is the eternal, triune God (the Father, the Son, and the Holy Spirit). He is the creator and sustainer of all life, creating the human race to enjoy a relationship with himself. Jesus Christ is the Second Person of the Trinity--God the Son. Jesus humbly took the form of a man and came to earth as Savior to redeem us. Jesus predicted to his disciples that he would die and then rise from the dead three days later, an event which would validate his claims to be God He did not try to escape death on the cross, but he submitted to it. REFERENCE: John 1:29, 2:19; Philippians 2:6-8; 1 John 4:2; Matthew 12:40, 26:52-54; Titus 2:13; Revelation 13:8. "For God so loved the world, that he gave his only Son, that whoever believes in him Jesus] should not perish but have eternal life" ( John 3:16) God the Father gave up his Son for us. His gift of eternal life is free to us, but it cost him crucifixion. God loves every person with an unconditional, divine love He created us to live in relationship with him, but the Bible says that sin and death entered the world through Adam, in the garden of Eden. Thus, all humanity is guilty of sin against God (Romans 3:23). REFERENCE: Matthew 26:31,39; Hebrews 9:22, 13:20; Revelation 13:8; Isaiah 53:4-6. COMPARE: No other religions' "founders" loved people so perfectly, nor sacrificed so greatly to prove it Other religions require human works for redemption. The good news of Christianity is that God has provided us with the way to himself. THE RESURRECTION OF JESUS CHRIST IS THE CENTRAL PILLAR OF CHRISTIANITY, and the evidence for its historicity is conclusive. We have the actual eyewitness accounts of this event in the Gospels of Matthew, John, etc. ; the empty tomb, despite the presence of the Roman guards, the transformation of the apostles, and the post-resurrection appearances of Jesus. By his resurrection Jesus conquered sin and death, thereby offering new life, eternal life, to us Jesus declared, "I am the resurrection and the life. Whoever believes in me, though he die, yet shall he live" ( John 11:25). REFERENCE: John 11:25; Acts 1:3; Hebrews 12:2; Matthew 17:9; 1 Corinthians 15:1-8. COMPARE: No other religions' "founders" ever conquered death by resurrection (returning to life). JESUS CHRIST CLAIMS TO BE THE ONLY WAY TO ETERNAL SALVATION. In his own words Jesus declared: "I am the way, and the truth, and the life. No one comes to the Father except through me" ( John 14:6). REFERENCE: John 14:6; Matthew 25:41; Acts 4:12; John 3:16; Romans 10:9; 1 Peter 3:18. COMPARE: Other religions and philosophies claim that all roads lead to God, but their contradictory beliefs cannot be reconciled. It cannot be true that "all roads lead to God." The various teachings about God from different religions contradict each other in critical ways. God cannot at the sametime be both impersonal and personal, both singular and triune, both finite and infinite, both knowable and unknowable. There is no way to reconcile the various worldviews, such as pantheism, monotheism, and polytheism. Therefore, logically, either none of them--or only one--is true The real issue is Truth, an issue of infinite importance. Do All Roads Lead To God? (Pack Of 25) was published by Crossway in August 2016 and is our 2662nd best seller. The ISBN for Do All Roads Lead To God? (Pack Of 25) is 9781682163221. 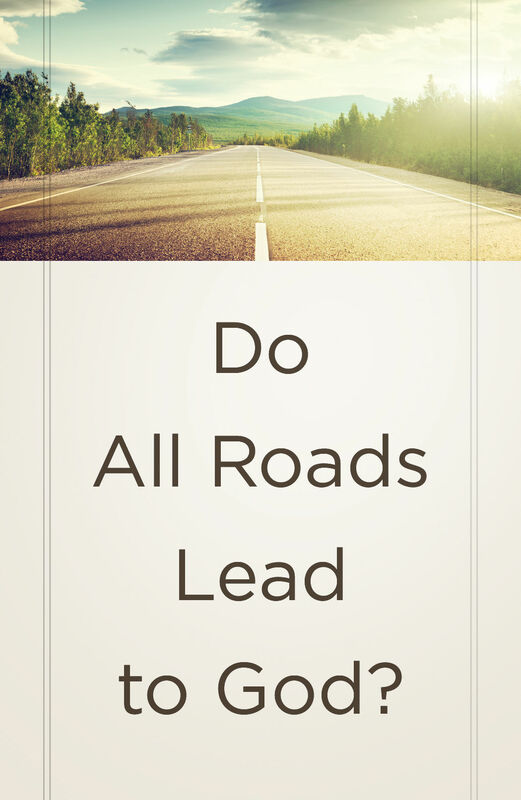 Be the first to review Do All Roads Lead To God? (Pack Of 25)! Got a question? No problem! Just click here to ask us about Do All Roads Lead To God? (Pack Of 25).